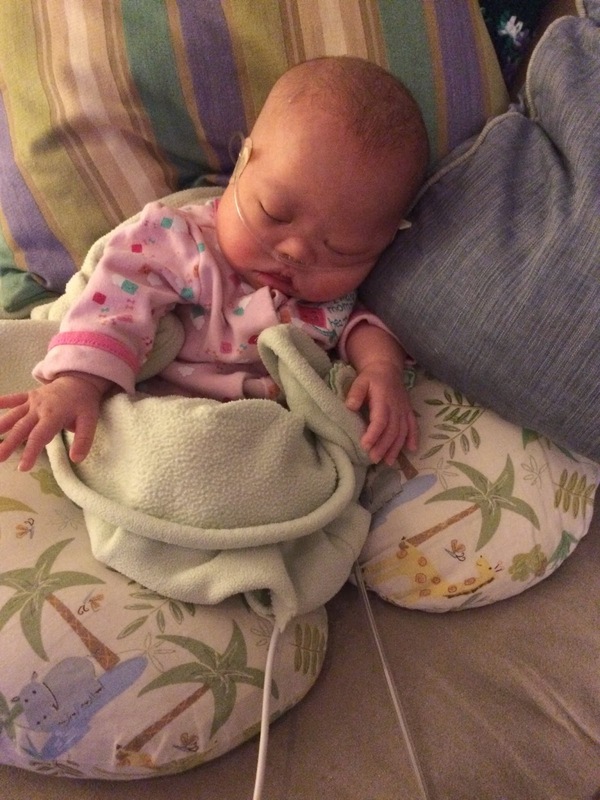 At the point where we knew that Evie couldn't leave the NICU unless she gained more weight, but that she wasn't doing that anytime soon, we said yes to the G-tube. A Gastostromy tube is a feeding tube inserted into the stomach (with a surgical procedure). Evie said bye-bye to her NG tube in her nose and said hello to her G-tube in her stomach. It broke my heart to say goodbye to her when she went into surgery. But she was in good hands at Boston Children's. Erick and I learned how to insert an extension tube into the G-tube port and feed her formula and medications through this tube. 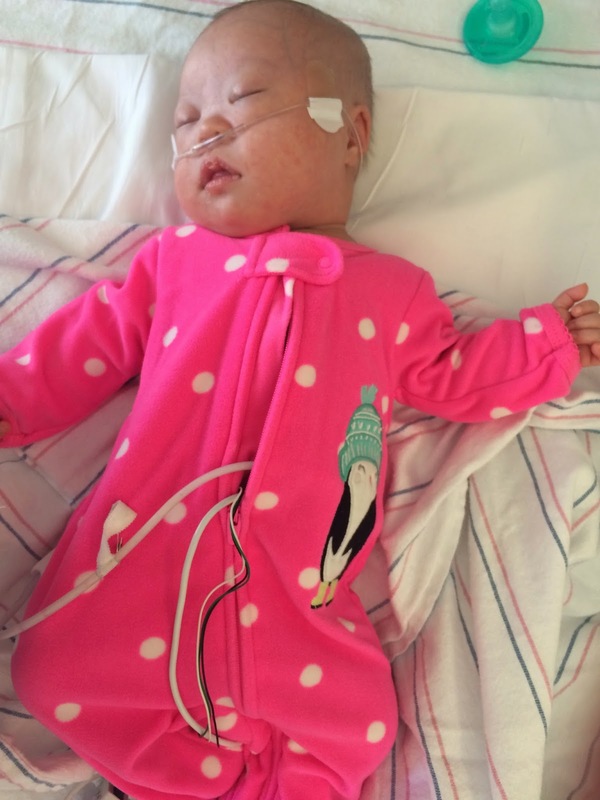 Evie gained enough weight to leave the NICU exactly 6 weeks after she was born. Freedom!! When she first came home, we had to feed her by mouth for 20 minutes and then by g-tube for the rest every 3 hours. The whole process took about 90 minutes. So by the time we finished, we had about a half an hour of rest before setting up for the next feeding. It was TORTURE. Then we realized that we were trying to adhere to the NICU schedule, which is the most artificial, unrealistic way to take care of a baby, since life happens a little differently outside of the hospital, where nurses don't change shifts every 12 hours and mommy and daddy actually need sleep. Having been in the NICU bubble for so long, it took me a bit to realize that I didn't have to live like that anymore. Our pediatrician, GI doc, and cardiologist gave us advice on how to spread out the feedings with higher volumes, and that changed our lives. I had searched online for people talking about their feeding schedules, but didn't really find anything. So I'll post more on our journey to normalcy with g-tube feedings later. I've come to appreciate the great network of families with experience with Down Syndrome. One of them told me about the Facebook group "Feeding Tube Awareness." I highly recommend this site as a way to get better acquainted with G-tube living. I had no idea there was a world of G-tube accessories! And that there were so many kids out there with G-tubes! Penguin zippered sleeper before mommy got smart and cut a hole in the bottom of the leg.